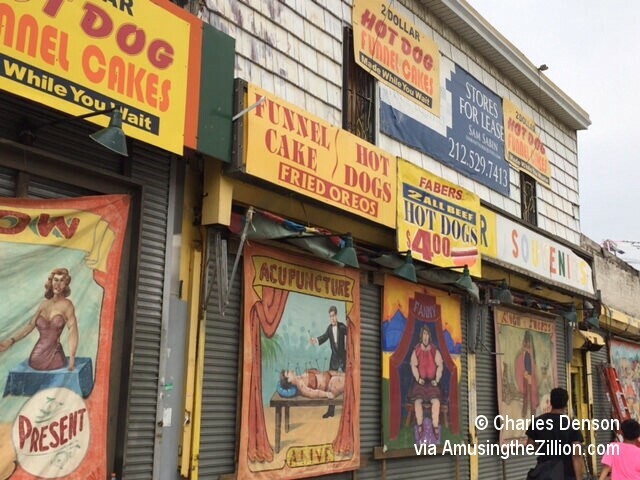 What does it feel like to leave Coney Island after more than 60 years? ATZ asked Jeff Persily, who grew up working his family’s games on the Bowery and recently closed the sale of three lots–1105, 1205 and 1207 Bowery– to Thor Equities. ATZ broke the news of the real estate deal in November, amid speculation that the Bowery buildings are destined for a date with the wrecking ball, as one of Thor’s long vacant lots on West 12th Street was rezoned by the Bloomberg administration for a 30-story hotel. Long owned by the Persily family, the properties stretch from West 12th Street to Jones Walk and are home to a dozen game, novelty and food concessionaires. With the acquisition of 1105 Bowery, Sitt now owns the entire block bounded by Surf Avenue and the Bowery with the exception of one privately held lot on Jones Walk. Persily’s late father Sid was the oldest of five children and supported his whole family through working at Coney, he says. “He was able to put himself through college and was a teacher (summers off), but still worked the games.” Sid’s siblings included Phil aka “Fishie,” a Coney concessionaire since 1929. 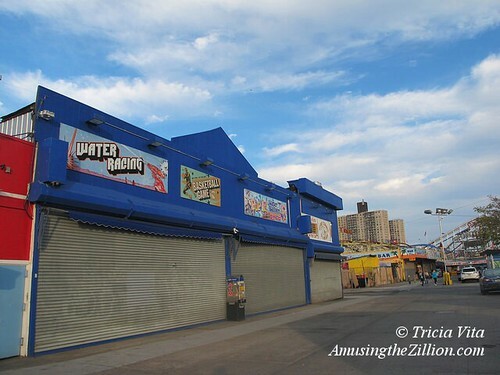 The Persilys introduced the first water race game to Coney Island in 1960 and once owned the bumper cars where Woody Allen would film the famous scene in Annie Hall (1977), says his son. The Persilys are among the very last families owning property in Coney Island to sell to Joe Sitt’s Thor Equities. Bukhara will also open a Red Mango franchise, for which he bought the rights from Rahman Hashimi, the Johnny Rockets franchisee, as well as a pretzel franchise. The Pizza Hut Express will be on the ground floor to the right of the 6,000 square foot Johnny Rockets, in a building that has been under stop-and-go construction since a lease deal was signed three years ago. 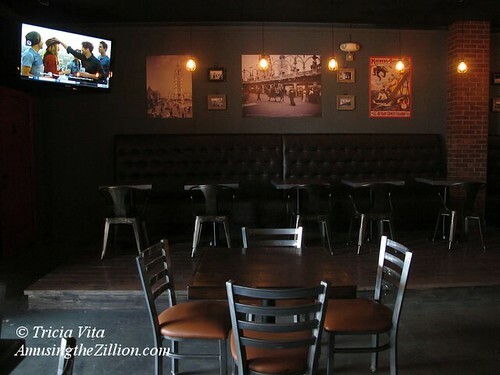 “You ask why we don’t do Mom and Pops,” Vitacco said last year, in an ongoing conversation that began with ATZ’s 2012 post “Will Coney Island’s Surf Ave Become a Mecca for Franchises?” He says that Mom and Pops wouldn’t be able to afford this, referring to the extraordinary delays and ballooning costs due to city and MTA red tape. 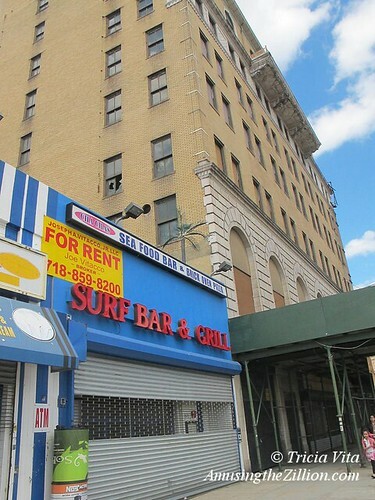 Unlike Manhattan, where Mom and Pops are being forced out by landlords who triple the rent and then turn around and lease to chains or upscale businesses, the new franchises on Coney Island’s Surf Avenue are replacing vacant lots or illegal furniture stores which have existed for years in defiance of the zoning. Until the early 1980’s the north side of Surf was home to individually-owned penny arcades and a variety of rides including bumper cars, carousels and even a Jumbo Jet-style coaster. 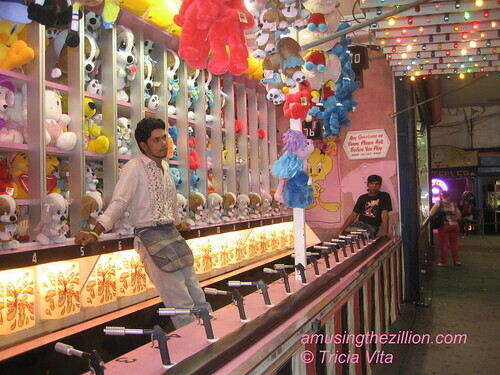 By the time the last ride– Coney Island’s B & B Carousell — closed in 2005, the north side was known as the wrong side of Surf Avenue to locate a business because of the lack of foot traffic. 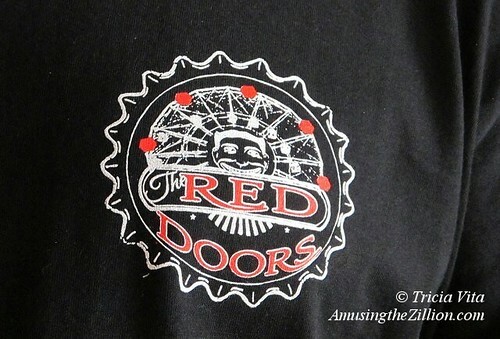 Now it is a mix of franchises and a few Mom & Pops like the Red Doors Bar & Grill and Luna Park Cafe. Nope, it’s not a mirage. 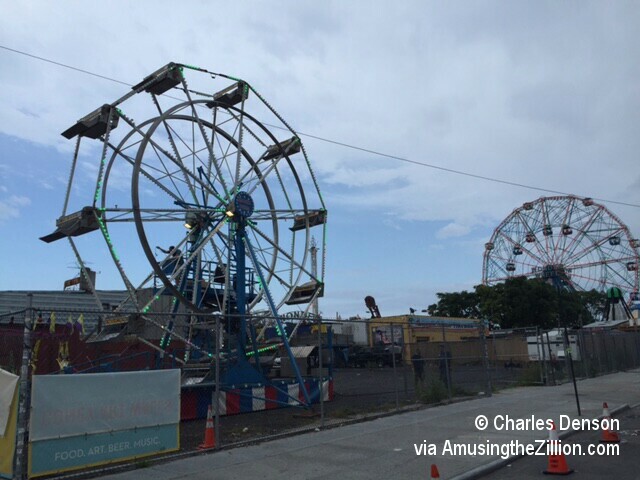 A little Ferris wheel has been set up within sight of Coney Island’s mighty Wonder Wheel! For two days and nights, HBO’s new rock ‘n’ roll series Vinyl has transformed Surf Avenue, including Thor Equities’ long vacant properties, into a 1970s carnival. In prep for Tuesday night’s shoot, a portable Ferris wheel was set up on the West 12th Street lot across from Coney Island USA. The lot has been vacant since the Bank of Coney Island was demolished by Thor in 2010. 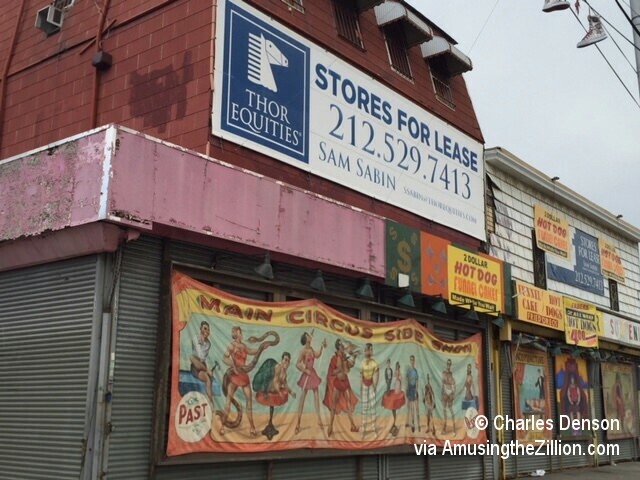 A vintage sideshow bannerline featuring a gorgeous cavalcade banner by the legendary Fred Johnson was hung from the forlorn-looking Grashorn Building, Coney’s oldest, also owned by Thor. Historian Charles Denson shot these surreal-looking photos on Tuesday afternoon before filming got underway. The HBO series from Martin Scorsese, Mick Jagger and Terence Winter is set to premiere in 2016. Surf Avenue businesses were reportedly paid several thou each to keep the lights blazing while the production company pulls an all nighter. What a bonanza! Too bad it’s only for a day and a night and the amusements can’t return for real to good ol’ Surf Avenue where they belong. The only use that the circa 1880’s Grashorn has seen since we started blogging in 2009 was as the Susquehanna Hat Company set for HBO’s Bored to Death (2011) and an office for the production company filming Men in Black 3 (2012). 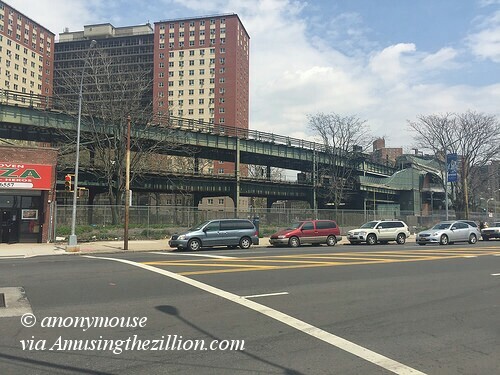 The Jones Walk side of the Grashorn building has been vacant for several years, as ATZ reported in “The New Coney Island: A Tale of Two Jones Walks.” Why? A business owner who had leased a small stand on the Walk from Thor in 2008 told us in 2009 that the rent had tripled from $8,000 to $24,000. He declined the space and left Coney Island, never to return. In the summer of 2010, Save Coney Island published renderings showing the potential of the building if restored, but their plan to create a Coney Island Historic District along Surf Avenue was crushed by Thor CEO Joe Sitt’s demolition of all but one of his historic buildings. Only the Grashorn remains. And apparently only HBO and Hollywood can afford the rent. 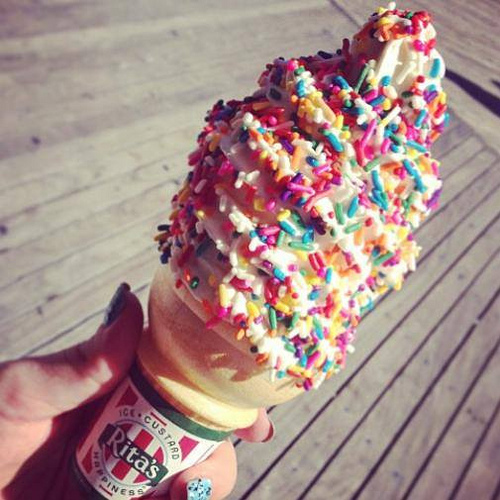 What’s new on the north side of Surf, the mecca for franchises in Coney Island? At 1315, where Cha Cha’s relocated from the Boardwalk until calling it quits after being devastated by Sandy, a permit has been taken out for interior renovations. A new eatery is going there and thankfully it won’t be another franchise or chain. The Russo Brothers, owners of Gargiulo’s, which is Coney Island’s bastion of fine dining, are planning to open a fast food Italian restaurant, according to Anthony Russo. Pizza, veal parm and fried calamari will be among the offerings Russo told ATZ. No opening date has been set, but construction is expected to get underway as soon as permits have been approved. The Russo brothers own the building as well as the adjacent one where tenants include Piece of Velvet Bakery and Rita’s Italian Ice on the corner of 15th Street. 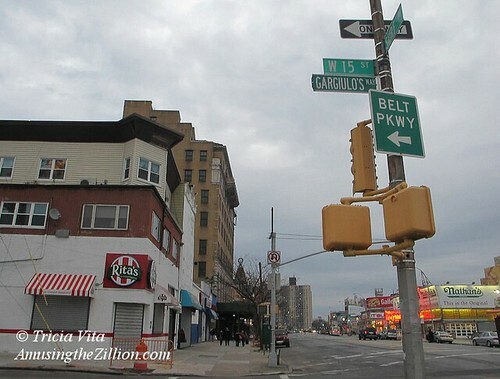 In 2007, West 15th Street between Surf and Mermaid Avenues was designated Gargiulo’s Way to mark the 100th anniversary of Gargiulo’s Restaurant. Founded by Gus Gargiulo and owned by the Russo family since 1965, the Coney Island landmark at 2911 West 15th offers classic Neapolitan cuisine. 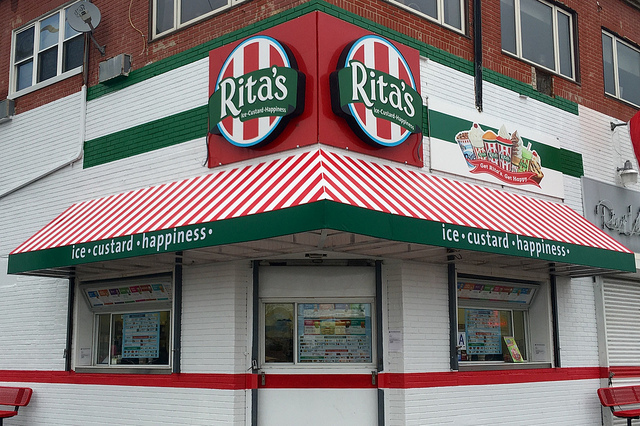 According to broker Joe Vitacco, who leased the storefronts to Rita’s and Piece of Velvet, there are very few remaining vacant spaces for lease on the north side of Surf. At 1223 Surf Avenue, he has 2,100 square feet on the first floor and 5,000 square feet plus 1,900 square foot terrace on the second floor and 4,000 square feet rooftop dinning for $45-$50 per square foot. The first floor of that address next to Stillwell Terminal was also leased to a Johnny Rockets (6000 sf) and Red Mango (2.000 sf) franchisee in 2012, but construction has been delayed by new and ever-changing post-Sandy building regulations. Among the stores Vitacco is offering are 1,450 square feet at 1019 Surf Avenue next to the new Subway Cafe and across the street from Luna Park. 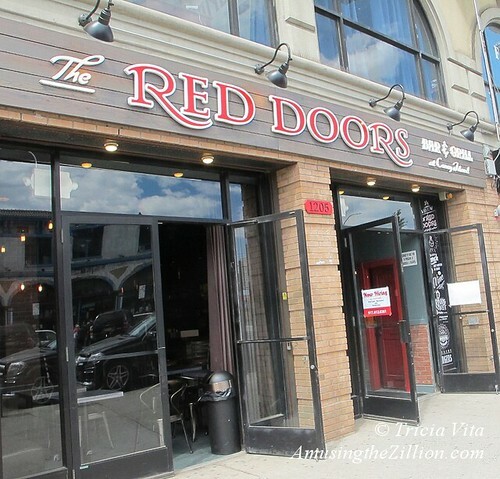 Coney Island 2015: Red Doors Bar & Grill Opens on North Side of Surf Ave.
Coney Island’s new Red Doors Bar & Grill opened its doors for drinks for the first time on Wednesday. ATZ sampled a raspberry lemonade (minus the vodka) from their cocktail menu. Restaurant consultant Gina Weinstein has put together a new menu and “cool, tattooish” decor mixing industrial design with posters of old Coney Island for this space on Surf Avenue near West 12th Street. Unlike many of the recently opened or soon-to-open eateries in Coney Island, it’s neither a chain nor a franchise! 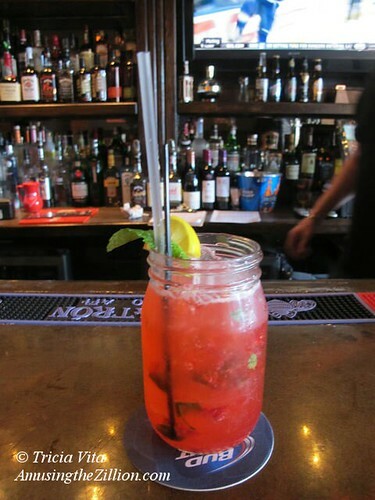 Red Doors’ owner Oleg says he expects the restaurant will open Memorial Day weekend. Menu selections include fresh baked pretzels with spicy beer mustard, pulled pork sliders, chicken quesadilla, buffalo chicken spring rolls, Caesar salad, a variety of burgers, fries, beer battered onion rings, and donuts made to order. The new Mom & Pop joins Grimaldi’s Pizzeria, Applebee’s, Subway Cafe, Dunkin Donuts and Surf 12 Nightclub on the north side of Surf. IHOP, Checkers and Johnny Rockets franchises are under construction. This location at 1205 Surf Avenue was formerly Bratva Bar and Coney Island Bar & Grill, which closed last year.